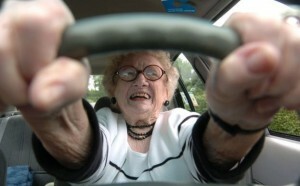 About 10,000 Americans turn 65 every day and there is now an epidemic of old people plaguing our nation’s highways. If current projections hold, by 2020 over 54 million Americans will be over the age of 65 and 7.3 million of them will be 85 or older. Unless we do something to cull this population, our highways will be all but unusable in the next few decades. Some people like to say that drivers between the ages of 65 and 69 have the same involvement in fatal crashes as people in their 30s, but here’s the difference. These old people are only driving a fraction of the amount of people in their 30s. And people over 85 are statistically more likely than teenagers to kill someone on the road. I think we can all agree that old people are stupid and gross. They also seem to think 55 miles per hour is a blistering speed. I understand that when they were growing up and traveling by horse and buggy, that would have been an almost unbelievable pace. Now, it’s the acceptable speed for cruising through school zones and church parking lots. Much like life, our highways have gotten faster and more complicated. Old people are incapable of meeting these challenges, and we should grind them up for fertilizer impose much stricter license requirements on them. I think we should set up an Xbox in all DMVs, and if people over 65 can’t evade the cops for at least 5 minutes in the game Need For Speed: Hot Pursuit, they have no business driving our modern roads.